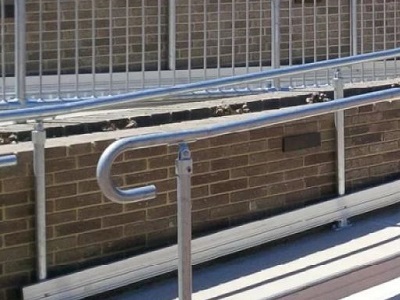 According to Australian Standard AS1428.1-2009 Clause 10.3 (g), ramps that intersect in an internal corridor need to be set back by a minimum of 400mm so that the handrail (compliant to Clause 12) does not protrude into the transverse path of travel. As shown in the plan and section view below, Moddex recommends a setback distance of 450mm minimum to allow for their Assistrail closure bends. To save time and resources, and ensure ease of installation when specifying Moddex handrails or balustrades, please consult the Hot Design Tip.